Only a few days have passed since Halloween, but some of you might already be reaching for the last few sweet treats in your (or more likely your child’s) candy bag. Among all the delectable chocolates, hard candies, and gelatinous goodies, you’ll surely find some form of corn syrup residing in your fun-size wrappers. This year, though, if you ask representatives from the Corn Refiners Association, they might tell you that high-fructose corn syrup stuff is pretty much just plain old sugar. A news item that has riled up many people, from the food industry, to health-conscious mothers, to school systems, is the proposed renaming of corn syrup — specifically high-fructose corn syrup (HFCS) — as corn sugar. It is no secret that corn syrup is experiencing a moment of infamy (or, rather, many moments of infamy). Documentaries like King Corn and Food, Inc., Michael Pollan’s seminal work The Omnivores Dilemma, and the nightly local news have served up serious exposés on the syrup. As a direct result of the attack on the sweetener, many companies have switched to providing all-sugar alternatives — look at Mountain Dew Throwback, a no-corn-syrup version of the cola, for example — and the food industry is losing money with products using HFCS. It’s not surprising that a large-scale marketing switch-up is currently underway. What is surprising, however, is the proposed name: corn sugar. For those in the know, corn sugar already exists — it’s a key ingredient in homebrewing as well as moonshining. Corn sugar is easily obtainable in 5 lb+ bags online and at your local feed and seed store, in rural areas, at least. I’m assuming since I’ve seen it at feed and seed’s that it’s used agriculturally but I’m not sure how. Commonly called D–glucose or dextrose, [it] is the chemical [alpha]–D–glucopyranose. It occurs as the anhydrous or the monohydrate form and is produced by the complete hydrolysis of corn starch with safe and suitable acids or enzymes, followed by refinement and crystallization from the resulting hydrolysate. 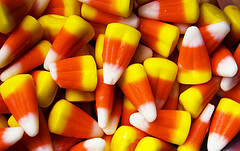 Beyond the fact that corn sugar as a final product already exists — literally as an anhydrous or monohydrate sugar produced from corn — the definition of corn sugar as anhydrous or monohydrate excludes HFCS since HFCS is half glucose, half fructose, with more than one enzyme required for manufacturing. As an alternate name used in marketing campaigns, corn sugar might help relieve the 20 year low in the sale of high fructose corn syrup, but it’s definitely not an accurate term, and it definitely doesn’t adhere to FDA regulations. While the Corn Refiners Association is claiming “sugar is sugar,” they might want to double-check their chemistry worksheets and rethink their marketing campaign — sugar is sugar but HFCS definitely isn’t corn sugar.